Why, hello, autumn! We’ve been waiting for you and all the delicious seasonal produce you bring. This recipe includes one of my favorite winter squashes, butternut squash, whipped into creamy perfection with carrots, ghee, and cinnamon. Winter squash is fantastic when it comes to antioxidants. It’s full of carotenoids, including beta-carotene, lutein, and zeaxanthin. Your body can convert some beta-carotene into vitamin A (you can only get true vitamin A from animal sources), a nutrient important for proper immune function, eye health, and antioxidant protection. Lutein and zeaxanthin are both key to maintaining optimal visual function. Carrots are also great sources of these carotenoids. Your body is better able to make use of these powerful carotenoids when they are accompanied with a fat, which is why this recipe is so fantastic. [2, 3] The fat from the ghee allows your body to absorb and use the carotenoids more effectively. Grass-fed ghee is also a good source of vitamin A, in its true form. And now, cinnamon. Cinnamon is one of my most favorite spices. It is excellent for supporting a healthy insulin response and reducing blood glucose levels. [4, 5, 6] You can learn more about cinnamon and why I recommend Ceylon cinnamon over other types in this post. 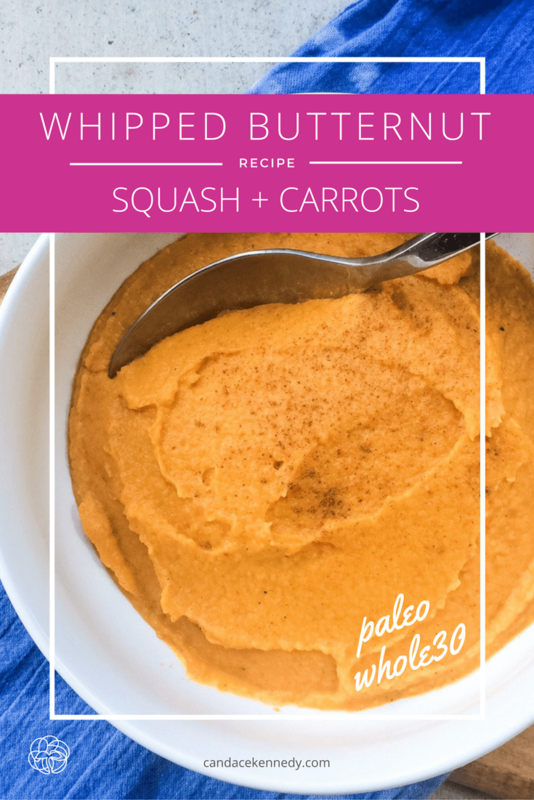 Paleo and Whole30 recipe for butternut squash, whipped into creamy perfection with carrots, ghee and cinnamon. Put all ingredients in a large food processor or mixing stand. Whip until everything is fully combined and nice and creamy. Top with a little extra sprinkle of cinnamon. Enjoy your whipped butternut squash and carrots and marvel at how quick and easy this recipe was. *To roast the butternut squash, preheat the oven to 375 degrees. Halve the butternut squash and place on a parchment paper-lined baking sheet, flesh side up. Coat the butternut squash in about 1-2 T of melted butter or ghee. You could also use coconut oil or avocado oil. Sprinkle with salt and pepper. Bake for 45-55 minutes, or until soft. I am not a doctor, and I don’t claim to be one. I can’t prevent, treat, cure or diagnose illness or disease. The information presented on this website is not intended as specific medical advice and is not a substitute for professional medical treatment or diagnosis. I make a small commission from the product links above, although the price of the products stays the same for you, whether or not you purchase through my affiliate links. You can purchase these products directly from the sites if you don’t wish to use my affiliate links.